William D. Hayward has been elected to serve as President and R. Scott Seifert has been selected as President-Elect of Hiersche Hayward Drakeley & Urbach PC, effective February 1, 2016. 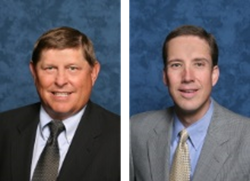 Mr. Hayward is a founding shareholder of the firm with more than three decades of legal experience and Mr. Seifert has been with the firm for nearly 20 years and is also a shareholder at HHDU. Hiersche, Hayward, Drakeley & Urbach, P.C. is pleased to announce that William D. Hayward has been elected to serve as President of the firm, effective February 1, 2016 and R. Scott Seifert has been selected as President-Elect. Mr. Hayward has more than three decades of legal experience. His practice focuses on corporate and business transactions, counseling clients on business deals and handling many different types of legal transactions including real estate, corporate finance, lending and mergers and acquisitions. Mr. Hayward has been awarded an AV® rating by his peers, the highest rating for legal ability from Martindale-Hubbell. He is known for his commitment to serving as a mentor and developing the skills and talents of the young attorneys at the firm. R. Scott Seifert has been selected as President-Elect. Mr. Seifert is a commercial litigator and shareholder at HHDU, and he has been with the firm for nearly twenty years. Mr. Seifert is a trial lawyer representing both plaintiffs and defendants in a wide range of business disputes including complex contract cases, shareholder disputes, lease disputes, covenants not to compete, trade secrets, nondisclosure agreements, and construction cases. He has tried many cases in both state and federal court and has a track record of success presenting to judges, juries and arbitrators. Mr. Seifert has previously served on the City of Frisco Planning and Zoning Commission for four years, and was selected for Leadership Frisco Class 2. Hiersche, Hayward, Drakeley & Urbach, P.C. is a full-service commercial law firm located in Addison, Texas. Their attorneys provide legal representation in a broad range of practice areas, including complex commercial litigation, business, real estate, mergers and acquisitions, employment law, insurance defense, intellectual property, bankruptcy, creditor’s rights, taxation, and estate planning. For more information visit the firm’s website at http://www.hhdulaw.com.